Cycles R Us specializes in NEW, USED and Aftermarket Motorcycle, Dirt Bike and ATV parts and accessories. We have been supplying quality used parts since 1996. CRU Products was started by Cycles R Us in 2009. Cycles R Us has been in the salvage business for over 20 years. Being in the salvage business, we not only see what parts are in a very high demand but what parts are in a very high demand that are costly at the dealership. Distributors & Dealers are welcome. Cycles R Us describes all parts as accurately as possible, but we are human and mistakes do happen. Please allow up to 2 weeks before your item ships. Fits: Suzuki RV125, TS125 This is the D/C system and will run head lights, tail lights, turn signals and charges the battery. This is a complete system including Rotor, Stator, Coil-CDI, Regulator (where applicable), Adaptor mounting plate (where applicable), Spark plug cap & hardware. 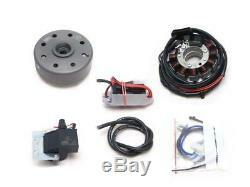 The Powerdynamo ignition system is a magneto based generator with integrated, fully electronic ignition. It is equipped with a tiny AC regulator to run lighting equipment, thus eliminating the need to run a battery. Powerdynamo external flywheel type ignitions are an analog type, CDI ignition with 80-100 watts of 12-volt lighting capacity capable of delivering up to 40,000 volts! Systems are available for Bultaco, Husqvarna, KTM, Maico, Sachs and Zundap engines. 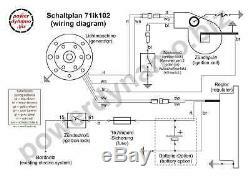 The Powerdynamo external flywheel type ignition system is a magneto based generator with integrated, fully electronic ignition, equipped with a tiny AC regulator to run lighting equipment, thus eliminating the need to run a battery. The Powerdynamo ignitions bolt on with no engine case modifications. The system provides a higher output with a very solid spark, for easy starting and lighting that does not take away from the ignition coil. Powerdynamo Ignitions are an analog type, CDI ignition with 80-100 watts of 12 volt lighting capacity, capable of delivering up to 40,000 volts! And remember to change those 6 Volt bulbs with 12 volt bulbs! Systems are available for the Bultaco, Hercules, KTM, Maico, Ossa, Sachs, Zundapp and small, medium and large shaft Husqvarna engines. See the Applications list for specific listings and part numbers. Motoplat Ignitions were imported and distributed by Penton from 1969 to 1993, the Spanish company's final year of production. We provide complete dynamic, diagnostic testing of the systems. Cycles R Us reserves the right to terminate any sales offered at our discretion. All items must be paid for within 14 days. Items not paid for in 14 days will be relisted. The item "Powerdynamo MZ-B VAPE Ignition System Stator Suzuki RV125 RV 125 TS125 TS 125 DC" is in sale since Wednesday, January 16, 2019. 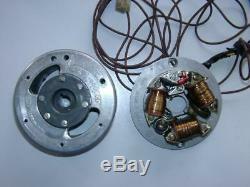 This item is in the category "eBay Motors\Parts & Accessories\Motorcycle Parts\Electrical & Ignition\Stators, Magnetos & Parts". 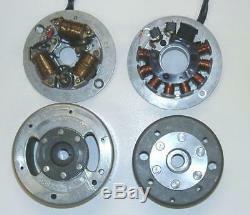 The seller is "cyclesrus-greatparts" and is located in Chippewa Lake, Ohio. This item can be shipped worldwide.